D: Hello Sara, how are you? D: It will be a new year soon, have you made any New Year resolutions? S: I have made a few. D: That’s great. What are they, if you don’t mind me asking? S: I don’t mind. Be more active, eat healthier and continue to grow my business. D: Wow, they sound like excellent resolutions. S: I think so, what are your resolutions? D: My plan is to also be more active and eat healthier. I’m going to run a marathon next year. S: Wow, a marathon, that’s ambitious. D: Yeah, I’m looking forward to the challenge. S: Well, best of luck. D: Thank you. I wish you all the best for next year too. Thank you for your support Danette, I appreciate the support. Definitely a good video for this time of year with people learning English! One of the best tips for learning a new language is try find a TV show that speaks that language and has your subtitles- that way you can hear actual conversations flowing and understand it a bit better with the subtitles. Thank you Samantha, I agree that watching TV in your target language is a good way to practice. It is very helpful for improving your listening skills. Videos have always been proven to be effective teaching tools. This one is going to be of great help for anyone who would like to learn English. It’s always best to teach a new language using conversations because that is when you use ‘normal’ words that are used when people are talking instead of the more formal ones. Thank you for your support. The aim is definitely to demonstrate conversations an English learner would actually use so they can practice both speaking and listening while they learn English online. When I lived in Japan, we used to watch this one show about a Chinese man teaching English conversation. It was the strangest show, as the conversations were always these odd discussions about things you’d expect to hear in, say, the 60s. Yours is great! It actually uses conversations that would come up. 🙂 Definitely far more helpful! Very happy to hear that the conversations are useful and relevant. Thanks for the support Nicole. Learning english can be difficult. We have alot of people who are english as a second language at our rec center. This is a great conversation topic starter for me. Very happy you found it useful Cindy. Thanks for the support. This is an awesome video for those learning English. It is prefect spoken pace and showing the words as spoken it such a plus for those learning. Thanks for sharing and well done. This is an awesome video for those learning English. It is a prefect spoken pace and showing the words when spoken is such a plus for those learning. Thanks for sharing and well done. Good time of year for this video!! My mother in law loved watching tv here and practicing English words while she was here. My husband says she is does the same thing in Peru too. 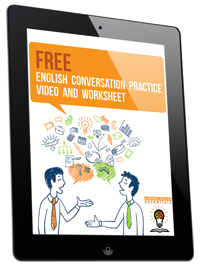 Great video and tips for those learning conversational English! Your videos are really great and bring about real life situations for practice! You make so many spectacular resources for learning the English language! Thank you so much for sharing them! I am certain that they will help a lot of people! This video is simple and clear. Great traits in a teaching video! This is such a cool way to learn English. Actually hearing the words seems so much more effective than reading them or studying them on paper. Thanks for the support @disqus_AhQclTLX5Q:disqus. Hearing the words does help you with pronunciation and to develop your listening skills. Thanks for watching the video. Great video- thanks for sharing! This is a fantastic resource for those learning English. Glad you found the video helpful, thanks very much for the support. I am in a diverse community where they have many ESL classes. However, if people could learn from your videos even before they came here to the States, they would have such an advantage. This video could also teach them part of our culture as many of them from Asia don’t celebrate the New Year with Goals in January. Their celebration is the Chinese New Year. Thanks @tammydoiel:disqus, people can use these videos to practice whenever they have access to the internet so they could practice before they come to an English speaking country. They can also use the videos to support their learning while they are in the country as well. Love this video! I have started doing my new years goals and they are so important! Thanks for the share! You’re welcome @disqus_RGBqQKaJOd:disqus Glad you found the video useful. Best of luck with your own goals. Thanks for watching. A marathon is ambitious! I have good friends who are married and they run together. They love the marathons! A marathon certainly is ambitious. I’m glad you liked the video @mail4rosey:disqus thanks for watching. Thanks fo sharing a great video! I remember watching tons of videos and movies to learn Spanish. Have to show your videos to some of my workmates who struggle with English. Thanks @ave_t:disqus, I appreciate the support. I’m glad you found the videos useful and I’d definitely appreciate you sharing the video. Thanks again. Happy you liked the video, glad you found the video useful. Thanks for the support. This is a great video for people trying to learn English. It was an awesome idea using New Year’s resolutions as the subject. Glad you found the video helpful @Cassie Tucker:disqus, thanks for your support. Very time appropriate. Learning a new language can really be a challenge, especially little phrases and meaning of some of the slang. Learning a language can be hard but if you learn everything in small parts and keep practicing, over time you will get there. The important thing is consistent practice. Thanks for your support @pennypennyspassionblogspot:disqus. 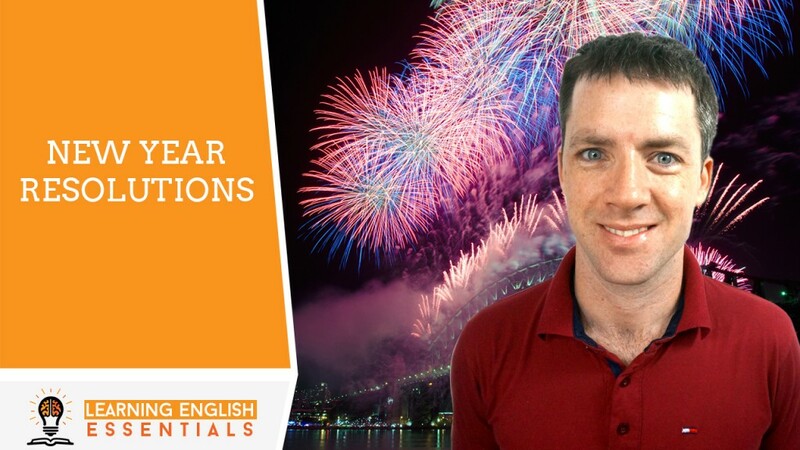 What a great idea for a video to incorporate new years resolutions, I am sure many people interested in learning the English language will love it! I’m glad you thought the video was useful. Thanks very much for watching. I appreciate the support. Thanks for this video. It is definitely perfect for those who are trying to learn English. Happy you found the video useful. Thanks for the support Victoria.